The world watched in wonder in 1969, as Buzz Aldrin and Neil Armstrong landed on the moon. 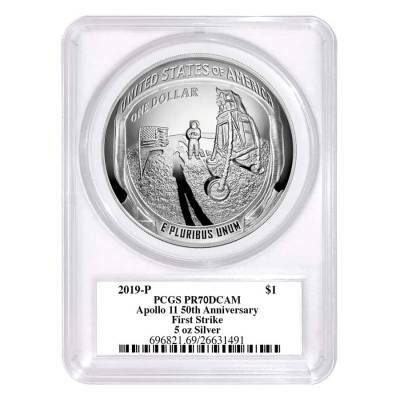 This exquisite 2019 P 5 oz Apollo 11 50th Anniversary Proof Silver Dollar Commemorative coin comes in PCGS PF 70 “perfect” certification and first strike release. It celebrates this first human-crewed moon landing. Even more, this silver dollar is now .999 fine silver with part of the proceeds going to worthy causes. This coin is sure to be a must-have among collectors and investors. The obverse showcases phases of the moon surrounding “MERCURY,” “GEMINI” and “APOLLO.” Inside this circle, you’ll find the footprint on the lunar surface. Together, they signify the admirable efforts of the U.S. Space program and what they did to get the first man on the moon. 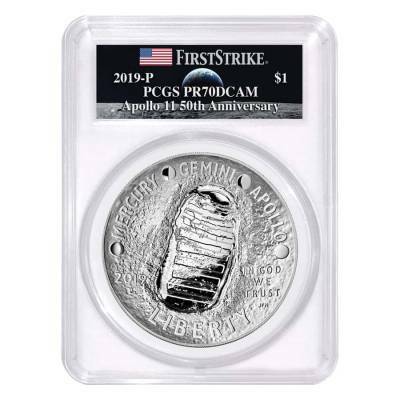 This coin is graded by PCGS with a grade of PF 70 - which certifies it as perfect. 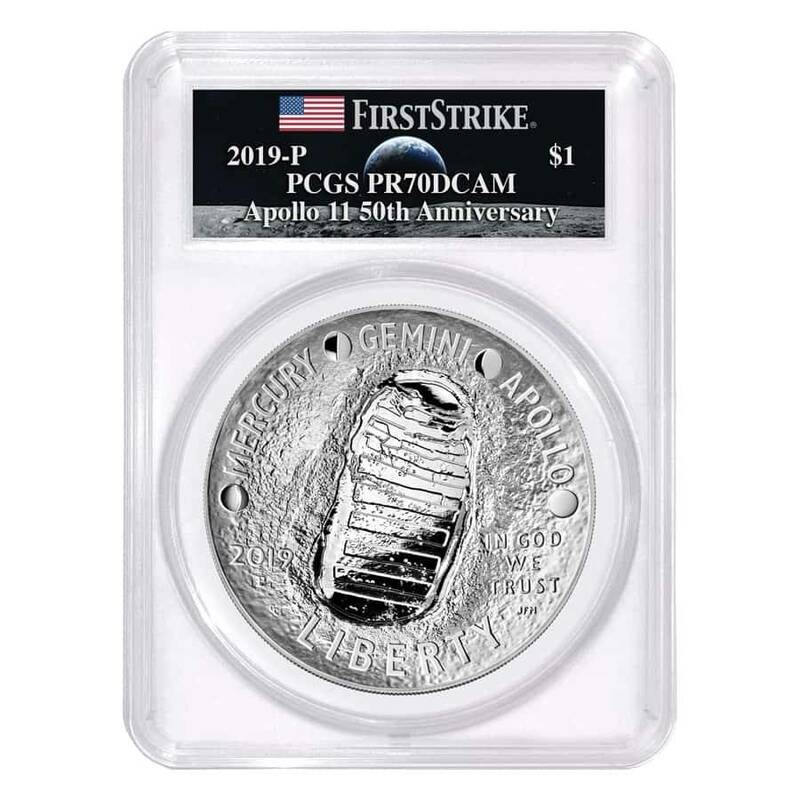 It is also guaranteed by PCGS with a First Strike designation meaning it has been graded within the first 30 days of issue. Obverse: Showcases phases of the moon surrounding “MERCURY,” “GEMINI” and “APOLLO.” Inside this circle, you’ll find the footprint on the lunar surface. 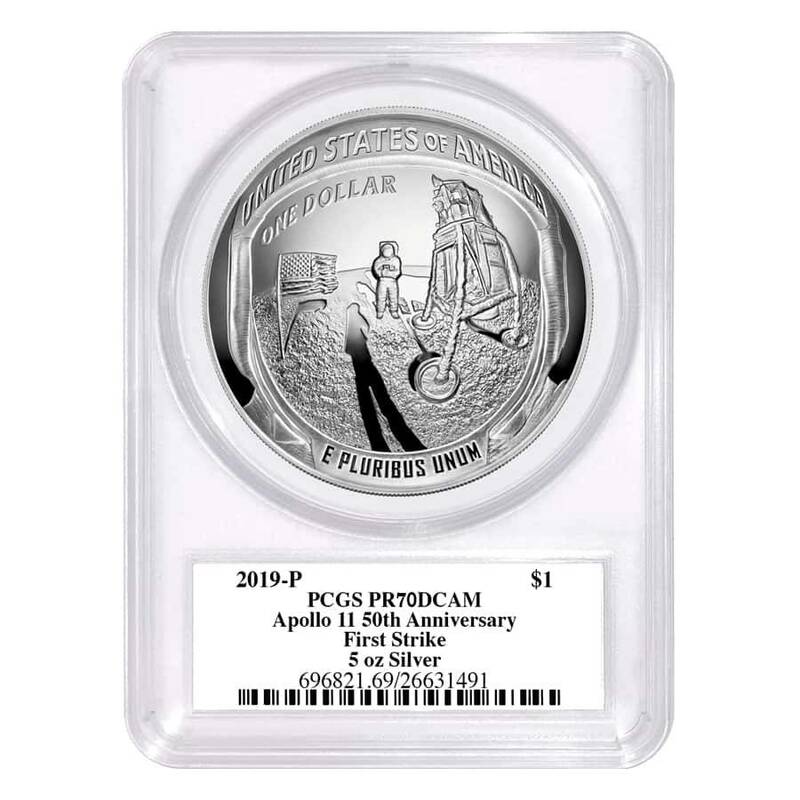 Don’t hesitate, order your exquisite 2019 P 5 oz Apollo 11 50th Anniversary Commemorative Coin today. We will package and ship to you with the highest of care. If you have any questions, please reach out to us via our easy-to-use website chat or email, our friendly customer service representatives will be happy to assist. With this purchase, you earn 450 Bullionaire Bucks 450 BB = $0.45. We currently have 4 of this item in stock. For every $1 spend, you will earn 1 Bullionaire Buck which is equivalent to $0.001 off a future purchase. 450 BB = $0.45.